The Southern Star Group is proud to offer an extensive range of entry and internal doors under our Big J brand. Designed to suit today’s varying architectural styles, our entry doors will make a lasting first impression for any home. An entry door can complement and set the tone and character of a home, whether contemporary or classic, warm and inviting, or sleek and sophisticated. We have several options of traditional or modern styles, and pivot doors - a popular entry style characterised by the doors ability to pivot from a point rather than the traditional hinged style. We also offer a series of internal doors that are far from just being a functional necessity - they can be an internal design feature of your home. Taking cues from interior design trends, the latest advances in manufacture and international décor themes, we offer a contemporary and traditional internal door collection that is both beautiful and unique. Doors are available in Duracote skin for painting and, for some styles, solid timber or timber skin for staining. We are confident that we have the right door to suit any home. 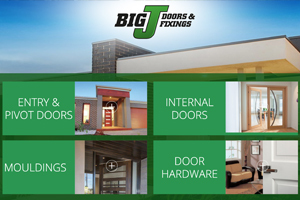 Big J** also offers a range of handles, mouldings and second fix materials. We now provide the convenience of a true ‘one stop shop’ for facade window and door, internal door and second fix requirement. **Big J products are currently not available in Queensland.